Macon County Patriots: Freedom Family Fun Day!! 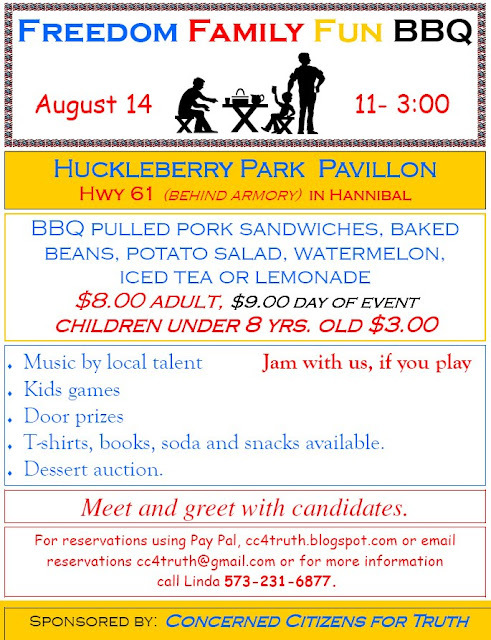 The temperatures are dropping and Concerned Citizens 4 Truth are holding a wonderful Family Day event in Hannibal, tomorrow 11 a.m. to 3 p.m. Candidates that have said they're dropping by are Roy Blunt, Blaine Luetkemeyer, Brian Munzlinger, Lindell Shumake and many others. This is a great opportunity to enjoy our freedom, with lots of great music, food, games for the kids, desserts, door prizes and just a great time. You're welcome to come out and jam with the band!